Angry Birds started out as a simple, physics-based title for the iPhone, but in just a few short years, has evolved into one of the biggest mobile franchises the world has ever seen. With the original, and the numerous subsequent titles now available on just about any platform with a user base higher than 10, it’s basically impossible to avoid those volatile avian creatures, and if you’re on Facebook, you might have caught wind of Angry Birds Friends. Recently released by Rovio Entertainment, the title plays on Facebook’s rather well-established social credentials, and with 60 million installs already, users of the world’s foremost social network seem to be taking the bait. 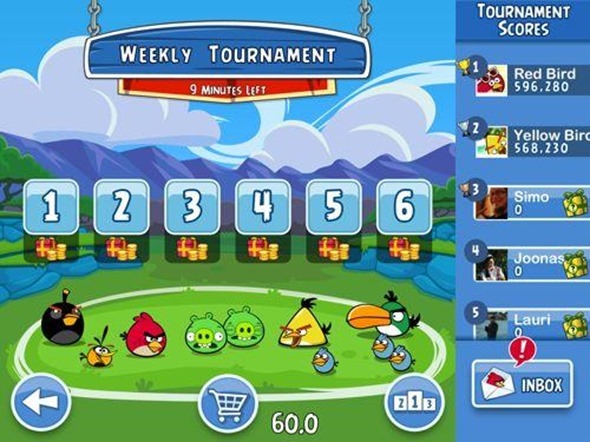 Following its success on Facebook, Angry Birds Friends will soon be making its way to iOS, allowing iPhone, iPad and iPod touch users to join in the socially-charged bird-slinging madness. There is a certain, quite obvious bit of irony in seeing the App Store, gateway to Angry Birds’ and Rovio’s successes, now taking up its position as part of the branching out process from Facebook. This full circle movement once again emphasizes that, in terms of casual gaming, the Angry Birds franchise is in a league of its own, and although the word "phenomenon" is thrown about rather cheaply nowadays, this inarguably goes down as one. Of the 60 million installs of Angry Birds Friends on Facebook, one quarter, or 15 million, are classified as monthly active users. Many developers will know that while getting somebody to install a piece of software is one thing, keeping them interested is a different animal, but it would seem the world still cannot get enough of Angry Birds. It has been quite a while since Angry Birds Star Wars descended on the App Store, and with Angry Birds Friends being a very socially-based title, I wouldn’t be surprised if it quickly becomes the most popular version to date, barring perhaps the original. Rovio’s embracing of social gaming has been relatively slow with all things considered, but with the seeds already sown for this one over at Facebook, it probably won’t take long for the Finnish company to make up for lost time.